India’s Home Affairs Minister recently visited Israel to discuss military cooperation and technology exchange. India’s Minister of Home Affairs Rajnath Singh recently visited Israel and met with Israeli Prime Minister Benjamin Netanyahu and Defense Minister Moshe Ya’alon on Thursday. 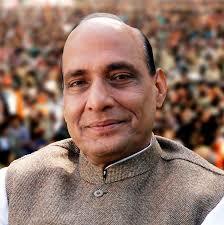 The Ministry of Home Affairs in India is charged with maintaining internal security, peace, and harmony. Singh arrived in Israel after attending the 83rd General Assembly of Interpol in Monaco. Singh’s trip to Israel is part of a strong Indian effort to improve ties with Israel on not just the rhetorical level, but on the level of tangible cooperation. While Singh was in Israel, former Israeli President Shimon Peres met India’s Prime Minister Narendra Modi in New Delhi. Reiterating the words exchanged between Israel and India when Modi met Netanyahu in New York in September, Modi told Peres his of strong desire to strengthen ties with Israel and learn from it in a variety of ways. In addition to weapons and security issues, Modi noted that Israeli agricultural technologies such as drip irrigation are extremely useful in an India that increasingly faces water shortages. During his meeting with Singh, Netanyahu said that Israel was “ready and willing” to share military technology with India, especially in areas such as aviation security and border protection. Additionally, they discussed methods to combat the indoctrination of terrorists. Netanyahu also expressed interest in participating in India’s new “Make in India” campaign. This included producing components of Israel’s vital defense industry in India. Netanyahu said that “Israeli industries, including the defense industries, could make in India and thereby reduce costs of manufacturing products and systems developed by Israel.” Due to Israel’s small size and incomplete industrial base, many of its defense industries actually manufacture Israeli defense products in third countries, particularly the United States. Having India as an additional option would help Israel diversify its manufacturing options. In return, India would gain valuable technological and defense transfers. This is, after all, the point of the “Make in India” campaign: to foster innovation and investment in India’s industries. A senior Israeli official said that “India is a very important ally for us and we view the Home Minister’s visit as very significant.” Israeli National Security Adviser Yossi Cohen took Singh on a helicopter tour of the Jordan valley and other regions in order to give him a sense of Israel’s security situation and security policies. These policies may already be inspiring changes in India’s attitude toward security, as evidenced by its increasingly tough responses to firing from the Pakistani side of the border in Kashmir. Despite some residual pro-Palestinian rhetoric in some circles in India, it is clear that India is explicitly and openly aligning more and more with Israel and is no longer interested in the Palestinian cause. After all, years of solidarity with the Palestinian cause under previous governments has gained India almost nothing while its relationship with Israel is already bearing fruit.